I'm not big fan of Jeera Rice before tasting it in one restaurant with the combination of Palak Panner. Seriously that day Palak Paneer was really awesome. So i want to try the similar combination in home. 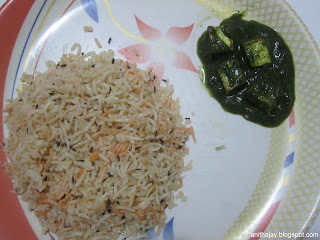 Jeera rice can be made in a two different ways and its very simple to do. I followed this recipe from vahrehvah with slight change. Heat oil in a pan.Add cumin seeds,once sputter add 2 cups of water ,salt and bring the water to boil. After that reduce the flame and cook util becomes dry.